Anne Eves and Dennis Stinson welcome you to Craiglands Bed and Breakfast in the heart of the Yorkshire Dales for Guest House holiday accommodation. 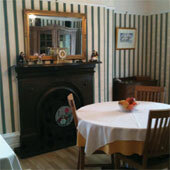 This Edwardian house offers elegant and comfortable accommodation in the lively Dales town of Grassington. There are many interesting and varied walks directly from the house, with maps and books available for guests. There is plenty to see and do from Craiglands Guest House. Outdoor enthusiasts will enjoy a wide range of Dales walks with the Dales Way passing close by and the Yorkshire Three Peaks less than an hour away. Cyclists and tourers can follow the 2014 Tour de France Route which passes through Wharfedale into Wensleydale and Swaledale. Find fly-fishing, rock climbing, caving and pony trekking locally. Visit Skipton with its castle, Fountains Abbey and the Bolton Abbey Estate with 12th-century Bolton Priory ruins and over 80 miles of footpaths. Malham Cove with its limestone rocks and Malham Tarn glacial lake are fascinating Dales landscapes to explore. York, Harrogate and the Bronte Country make great day trips. 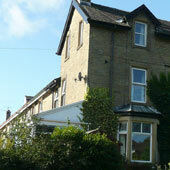 Grassington Bed and Breakfast Accommodation: Craiglands Guest House offers double, twin and single rooms with en-suite facilities, as well as single room with private facilties. These centrally heated bedrooms are well furnished and each has colour TV with tea, coffee and hot chocolate making facilities. Enjoy quality breakfasts using local produce with a wide choice including vegetarian options. Packed lunches are available on request. Sorry no smoking or pets. Private off-road parking. Good choice of local restaurants and pubs serving food.